SPAT (Screen Printers Association of Tirupur) members swung into action to help people affected by Gaja cyclone. It is said, “In service of humanity lies success”. 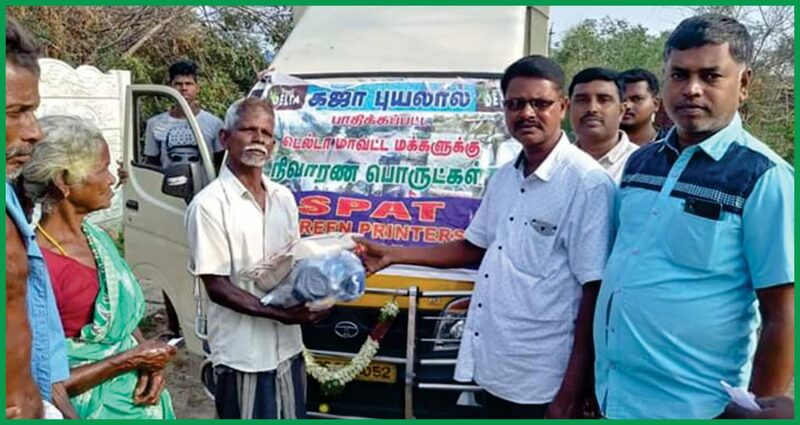 Following the severe cyclone, Gaja that hit the east coast of South India in November, 2018, the members of Screen Printers Association (SPAT) swung into rapid action. A 20 member team, of the Association collected donations in cash and kind and headed to Pudukottai, one of the severely cyclone hit areas in Tamil Nadu. The donations received in kind, included: rice, dal, vegetable, bed sheets, banyan, napkins, medicines, etc which were distributed to about 400 families for two days. “Serving the humanity at times of calamities is our passion and we will continue to do so in future as well, although we pray that such calamites should never occur again,” says Shanmugan G, one of the active members of SAPT and also the owner of S. S. Printing, a garment printing company in Tirupur having automatic, manual, glass table printing facilities. The SAPT has about 90 members. At a time of reporting this news update, there was yet another severe cyclone (6th one), named “Phethai” which hit Andhra Pradesh coast in Mid-December 2018. Gaja was the fifth cyclone that hit in 2018 after cyclones Dipesh , Sagar, Mekunu and Titli. As many as 81,948 people were evacuated from low lying areas of Tamil Nadu and were sheltered in 471 relief centres in six districts Cuddalore, Nagapattinam, Pudukottai, Thanjavur, Ramanathapuram and Tiruvarur. “I urge our fellow screen printers to come forward to serve humanity at times of such calamities,” concludes Shanmugan.